It can be used in medical organizations like dental clinics, ophthalmology department, E.N.T. department, gynecology department, surgical operation room to sterilize the surgical instrument, glassware etc. Fast: 9~15 minutes working cycle, faster than normal steam sterilizer. Safe: The short heat time for medical instrument, make the instrument safety and keep the working life longer. 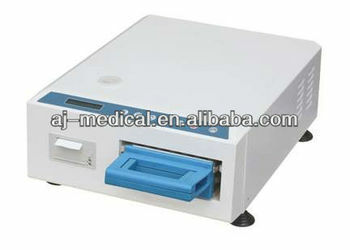 Convenience: Simple operating, sterilize cassette can be used as loading and transport tools, and storage. Easily sterilize and use. Displace, heating, pressure rising, sterilizing, and exhaust, dry. Whole cycle is controlled by computer and automatic running. Build-in steam generator, steam source is not needed from outside. Digital printer can print the cycle time and various parameters of the running cycle. Our sterilizer provides 4 kind of automatic sterilize cycle. Each cycle designed for one specific instrument. If the parameters like temperature, pressure, time haven’t achieved the setting value, or the autoclave has problem when running, the micro-computer system will halt the cycle running and display the problem on the LCD screen.